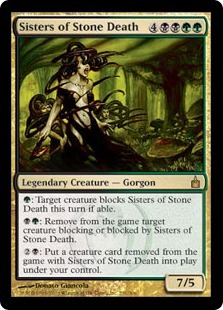 Card Text: G: Target creature blocks Sisters of Stone Death this turn if able. BG: Remove from the game target creature blocking or blocked by Sisters of Stone Death. 2B: Put a creature card removed from the game with Sisters of Stone Death into play under your control. Oracle Text: G: Target creature blocks Sisters of Stone Death this turn if able. BG: Exile target creature blocking or blocked by Sisters of Stone Death. 2B: Put a creature card exiled with Sisters of Stone Death onto the battlefield under your control.